The Khmer Republic (Khmer: សាធារណរដ្ឋខ្មែរ, French: République khmère) was the pro–United States military-led republican government of Cambodia that was formally declared on 9 October 1970. Politically, the Khmer Republic was headed by General Lon Nol and Prince Sisowath Sirik Matak that took power in the 18 March 1970 coup against Prince Norodom Sihanouk, then the country's head of state. The wildlife of Cambodia is very diverse with a registered 212 mammal species, 536 bird species, 176 reptile species (including 89 subspecies), 850 freshwater fish species (Tonlé Sap Lake area), and 435 marine fish species. An unknown amount of species remains to be described by science, especially the insect group of butterflies and moths, collectively known as lepidopterans. Many of the species in the country, including several endemic ones, are recognized by the IUCN or World Conservation Union as threatened, endangered, or critically endangered due to deforestation and habitat destruction, poaching, the illegal wildlife trade, and farming, fishing, and forestry concessions. Intensive poaching may have already driven Cambodia's national animal, the kouprey, to extinction, and wild tigers, Eld's deer, wild water buffaloes and hog deer are at critically low numbers. Gambling in Cambodia is officially illegal under the 1996 Law on Suppression of Gambling, which outlawed all unauthorized forms of gambling and provided for penalties ranging from monetary fines to short prison sentences, although the Cambodian government's General Department of Prisons does not list gambling as one of the 28 offenses punishable by imprisonment. Khmer cuisine (Khmer: សិល្បៈខាងធ្វើម្ហូបខ្មែរ) or, more generally, Cambodian cuisine, is the traditional cuisine of the people of Cambodia. Average meals typically consist of more than one dish and ideally contrast flavours, textures and temperatures within the meal using plenty of herbs, leaves, pickled vegetables, dipping sauces, edible flowers and other garnishes and condiments. Every year, more than 1 million tourists visit Angkor Wat in Siem Reap, Cambodia. The human rights situation in Cambodia is facing growing criticisms both within the country and an increasingly alarmed international community. After a series of flagrant violation against basic human rights a feeling of incertitude regarding the direction the country is emerging, sometimes comparing the situation to a newborn Burma. The Early history of Cambodia follows the prehistoric and protohistoric development of Cambodia a country in mainland Southeast Asia. Thanks to archaeological work carried out since 2009 this can now be traced back to the Neolithic period. As excavation sites have become more numerous and modern dating methods are applied, settlement traces of all stages of human civil development from neolithic Hunter-gatherer groups to organized preliterate societies are documented in the region. The effects of deforestation and subsequent flooding can be seen from space on ordinary satellite images. This image is from the Terra satellite in 2002. Cambodia is one of the world's most forest endowed countries that has not yet been drastically deforested. However, massive deforestation for economic development threatens its forests and ecosystems. The country has one of the highest rates of deforestation in the world, third only to Nigeria and Vietnam, according to the United Nations Food and Agriculture Organization (FAO). Cambodian women are traditionally expected to be modest, soft-spoken, "light" walkers, well-mannered, industrious, belong to the household, act as the family's caregivers and caretakers and financial administrators, perform as the "preserver of the home", maintain virginity until marriage, become faithful wives, and act as advisors and servants to their husbands. The "light" walking and refinement of Cambodian women is further described as being "quiet in […] movements that one cannot hear the sound of their silk skirt rustling". As financial administrators, the women of Cambodia can be identified as having household authority at the familial level. 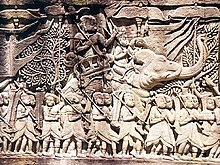 A scene of the Mahabharata in an Angkor Wat stone relief: Two asuras, the brothers Sunda and Upasunda, fight over the possession of the beautiful apsara Tilottama. Some ancient Cambodian local legends were influenced by the Hindu epics. The written literature, mostly restricted to the royal courts or the Buddhist monasteries. The oral literature, which is based on local folklore. It is heavily influenced by Buddhism, the predominant religion, as well as by the Hindu epics Ramayana and Mahabharata. The National Assembly (Khmer: រដ្ឋសភា, French: Assemblée nationale) is one of the two houses (chambers) of the Parliament of Cambodia. It is referred to as the lower house, with the Senate being referred to as the upper house. After the fall of the Pol Pot regime of Democratic Kampuchea, Cambodia was under Vietnamese occupation and a pro-Hanoi government, the People's Republic of Kampuchea was established. A civil war raged during the 1980s opposing the government's Kampuchean People's Revolutionary Armed Forces against the Coalition Government of Democratic Kampuchea, a government in exile composed of three Cambodian political factions: Prince Norodom Sihanouk's Funcinpec party, the Party of Democratic Kampuchea (often referred to as the Khmer Rouge) and the Khmer People's National Liberation Front (KPNLF). ... that Charmian Gooch's investigation into the Cambodian timber trade deprived Pol Pot and the Khmer Rouge regime of US$90 million a year? ... that FUNCINPEC started as a Cambodian resistance movement and later became a political party? ... that the first research center for potatoes in Cambodia was opened in the country in 2016? ... that the orange-necked partridge, native to southern Vietnam and eastern Cambodia, was discovered in 1927 but was "lost" until its rediscovery in 1991? ... that French singer-songwriter Indila, who has described herself as a "child of the world", is of Algerian, Cambodian, Egyptian, and Indian descent? Do you have a question about Cambodia that you can't find the answer to? For editor resources and to collaborate with other editors on improving Wikipedia's Cambodia-related articles, see WikiProject Cambodia. This page was last edited on 6 February 2019, at 08:20 (UTC).